Know what a buckler is? 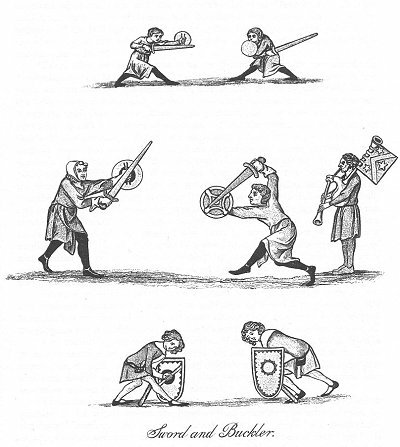 Small shield used in swordplay. 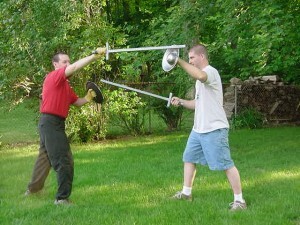 Instead of using it to cover up, the combatants slap the swords of their opponents out of the way. It was a fully functional weapon in its own right. I doubt anyone would be too thrilled to be punched in the face with a disc of steel. knirirr mentioned this photo page some time ago, but I have just now found the time to take a good look at the pictures on display. It is of a quarterly sword bout called The Grand Assault at Arms, an invitational event that I believe is held in the United Kingdom. The photos are fascinating to someone like myself, who is interested in historical martial arts. I am not sharing any with you here because the people who set up the Flikr account don’t want any downloaded, and I am respecting their wishes. The mix of combat styles and weapons is heady stuff. As one of the attendees said, “People can fence with whatever weapons they like, so long as their opponent is consenting!” I think this is the first time I have seen pictures of bucklers used in an actual match. Wish I could attend. Maybe if my ship comes in! 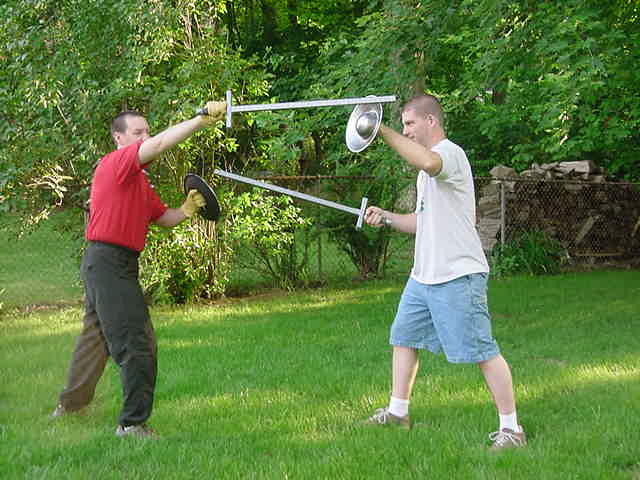 Years ago I used to do a form of LARP based around steel weapons combat. And my choice was sword-and-buckler (we were set roughly 1580-1600 IIRC), this contrasted with the other classical combination for the period of rapier and dagger. Hence the term “swashbuckler” — a fighter who swings his buckler around dramatically. May I ask upon what source(s) you base your system? If that’s Jaron Bernstein then they are a former ARMA study group. I’d be curious to hear which historical sources they are working from as well. We use the various medieval manuals from 1389-1610 for our local group. We are currently using Meyer and Peter von Danzig. What we do is very closely based on the manuals and is also quite practical as well. 🙂 Email me at krovos@hotmail.com if you want to try it out. James – Kirk Lawson and Ken Pfrenger run events in Ohio on a periodic basis. There was also an event last weekend in Maryland with a spiffy set of tournaments – sword and buckler starts about 55:45. They’re definitely worth seeking out, particularly if one’s interest is in unarmed Western material.